Academic FEDERICO DEMARIA will be addressing staff at the European Commission today in a keynote speech about the crucial issues of economic growth and environmental degradation. He asks, is the well-being of the individual, societies and nations possible beyond economic growth? There is an uncomfortable scientific truth that has to be faced: economic growth is environmentally unsustainable. ‘Growth for the sake of growth’ remains the credo of all governments and international institutions, including the European Commission. Economic growth is presented as the panacea that can solve any of the world’s problems: poverty, inequality, sustainability, you name it. Left-wing and right-wing policies only differ on how to achieve it. However, there is an uncomfortable scientific truth that has to be faced: economic growth is environmentally unsustainable. Moreover, beyond a certain threshold already surpassed by EU countries, socially it isn’t necessary. The central question then becomes: how can we manage an economy without growth? Kenneth Boulding, the economist, famously said that: “Anyone who believes that exponential growth can go on forever in a finite world is either a madman or an economist”. Ecological economists argue that the economy is physical, while mainstream economists seem to believe it is metaphysical. Social metabolism is the study of material and energy flows within the economy. On the input side of the economy, key material resources are limited, and many are peaking including oil and phosphorus. On the output side, humanity is trespassing planetary boundaries. Climate change is the evidence of the limited assimilative capacity of ecosystems. It is the planet saying: ‘Enough is enough!’. Mainstream economists – finally convinced by the existence of biophysical limits – have started to argue that economic growth can be decoupled from the consumption of energy and materials. Historical data series demonstrates that this – up to now – has not happened. At most, there is relative decoupling – a decrease in resource use per unit of GDP. But, there is no absolute decoupling which is what matters for sustainability: an absolute decrease of environmental resources consumption. The only periods of absolute dematerialisation coincide with economic recession. Trade should also be taken into account, to avoid externalisation of pollution intensive activities outside the EU. The current economy cannot be circular. The main reason being that energy cannot be recycled, and materials only up to a point. The global economy recycles less than 10 percent of materials; about 50 percent of processed materials are used to provide energy and are thus not available for recycling. It is simple: economic growth is not compatible with environmental sustainability. The list of nice oxymorons is long – from sustainable development to its reincarnations like green economy or green growth – but wishful thinking does not solve real problems. Increase in GDP leads to increase in material and energy use, and therefore to environmental unsustainability. Technology and market based solutions are not magic bullets. Faith in technology has become religious: scientific evidence shows that, based on past trends in technological improvement, these are coming way too slowly to avoid irreversible climate change. For instance, efficiency improvements lead to rebound effects, in the context of economic growth (the more efficient you are, the more you consume; e.g. cars and consumption of gasoline). Renewable energy produces less net energy, because it has a lower EROI (Energy Return on Investement) than fossil fuels. For this, and other reasons, it cannot satisfy current levels of energy consumption, which therefore needs to be reduced. Most of the world’s fossil fuel reserves must be left in the ground, unburned, to keep a global temperature rise to no more than 2°C. In fact, fossil fuels should be called unburnable fuels. Science sometimes brings bad news. An article recently published in Nature Sustainability argues that: “No country in the world meets the basic needs of its citizens at a globally sustainable level of resource use.” The question then is: How can the conditions for a good life for all within planetary boundaries be generated? The uncomfortable truth to be faced by policy makers is the following: Economic growth is ecologically unsustainable. The total consumption of materials and energy needs to be reduced, starting with developed countries. Economic growth is fueled by debt, which corresponds to a colonization of the future. This debt cannot be paid, and the financial system is prone to instability. For instance, scientifically it is not clear how the European Union will achieve a low-carbon economy in the context of economic growth, since it implies a reduction of greenhouse gas emissions to 80% below 1990 levels by 2050. 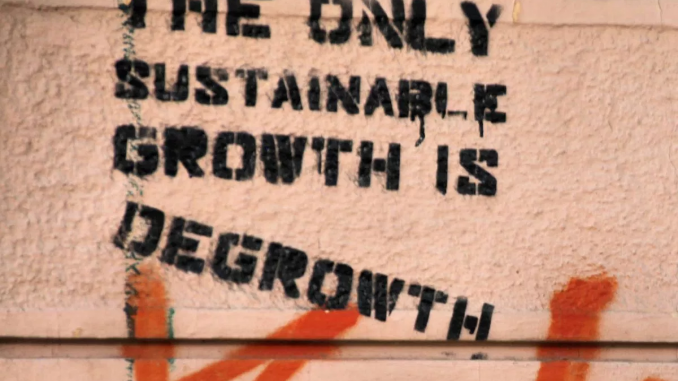 Obviously, a transition from a growth society to a degrowth one poses several challenges. However, the emerging field of ecological macroeconomics is starting to address them convincingly. Happiness and economics literature shows that GDP growth is not needed for well-being, because there are other important determinants. High life expectancy is compatible with low carbon emissions, but high incomes are not. Moreover, lack of growth may increase inequalities unless there is redistribution. In any case, the issue is not whether we shall abandon economic growth. The question is how. Scientific debates around it are on the rise, but I am afraid policy making is behind. 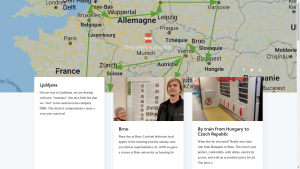 There are good signs: critiques of GDP as an indicator of well-being are common, there are policy proposals and degrowth is entering into the parliaments. This is not new. For example, in 1972 Sicco Mansholt, a Dutch social-democrat who was then EU Commissioner for agriculture, wrote a letter to the President of the EU Commission Franco Maria Malfatti, urging him to seriously take into account limits to growth in EU economic policy. Mansholt himself became President of the European Commission after only two months, but for too short a term to push a zero growth agenda. Federico Demaria is an ecological economist at Environmental Science and Technology Institute, Universitat Autònoma de Barcelona. He is the co-editor of Degrowth: A Vocabulary for a New Era, and of the forthcoming Pluriverse: A Post-Development Dictionary.